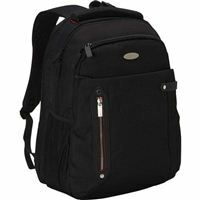 Pro Tech Laptop Backpack contains multiple sleeves and pockets making it easy to carry your everyday essentials from your cell phone to your credit cards. It also contains a dedicated laptop sleeve for a laptop up to 15.6". 15" X 19.25" X 5"